Looking for a place to take your furry friend? Here is a listing of dog parks around the region. Although most parks are open from dusk until dawn, please check websites for any closures before heading to your favorite park! Call 219-769-PARK to purchase annual passes or stop by the Lake County Parks corporate office at 8411 E. Lincoln Highway just west of Deep River Waterpark on U.S. 30. Office hours are M-F 8:30 a.m. until 4:30 p.m. Located at Central Park, the three acre facility includes a small dog area and a large dog area. Complete with benches, dog waste stations and a shelter in each section, the dog park is open daily from dawn to dusk, 365 days a year. Each area of the park includes its own water fountain for the dogs (but is only on seasonally during the warmer times of the year). 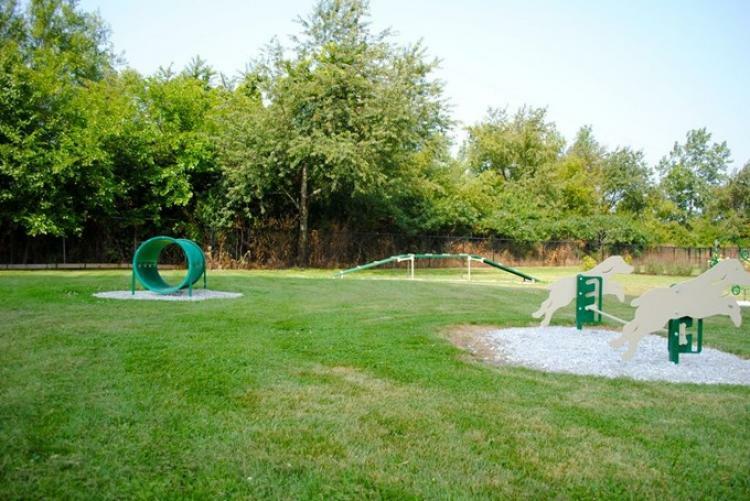 This 3-acre dog park is located on the east side of the park, just south of the formal gardens. The dog park is a gated park for members only and is sectioned in two divisions, one for small dogs and one for large dogs. The park is equipped with dog drinking fountains and dog play equipment. Munster Parks and Recreation hosts their annual doggie paddle the last day of pool season and the Pooch a Palooza Dog Fair in August each year. Registration begins in May. Activities include equipment for obedience and agility activities. There is also open play areas for free activity such as frisbee and ball catching. Additional amenities include benches, drinking fountains (for dogs and people), waste disposal area, earth berms, native planting, shelters, and a sign at entry detailing the rules and regulations of the park. For fee information call 219-853-6300. Our dog park – upgraded in 2016 – features pet fountains, benches for leash holders and plenty of space for your pooch to run around. One of the best features of the new dog park: a plan to preserve the verdant green turf. The dog park is located at 10051 Hedwig Drive, St John, Indiana 46373. Users are required to purchase a permit each calendar year at the St. John Town Hall, 10955 West 93rd Avenue. The "Bark Parks" are a great place to bring your dogs to exercise. The areas are fully fenced in. The "Bark Parks" at Bluhm and Creek Ridge feature many events for the dog to enjoy like; Tire Jump, Dog Walk, Window Jump, Rover Jump Over, Doggie Crawl, King of the Hill, and Pause Table. Royal Acres Country Club is a privately owned dog park located at 3554 South Sturdy Road in Valparaiso, Indiana. The park is a five acre grassy area enclosed by a six foot fence. It provides a safe place to exercise and socialize for dogs and their people. A dog park, a 200 ft. by 100 ft. fenced-in area, is located on the south end of Lakeland Park, 1200 Lakeland Park Dr. in Burns Harbor. Lakeland Park is available to all residents as well as any visitors. Dogs must be on a leash when outside of the dog park.